No, it’s not a stunt to promote the latest Michael Bay movie Transformers: Revenge of the Fallen. It’s just an ordinary man with a lot of time on his hands, a love of the 80’s cartoon Transformers, a crane, and a spare Volkswagen Beetle. He turned a yellow VW bug into a full-scale model of the transforming Autobot hero Bumblebee (the original version, not the movie version). It’s seriously awesome! What possesses someone to do this kind of thing? Tom Rhoads started the project after the birth of his son. 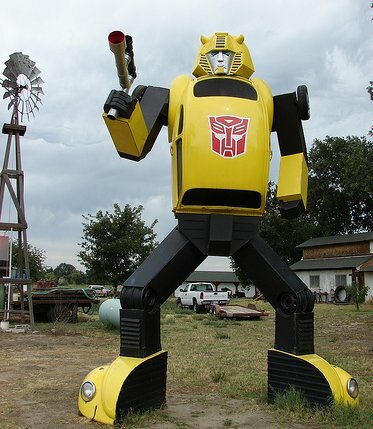 After all, what boy wouldn’t love a giant transforming car/robot in his front yard? That’s really the perfect birthday gift for any boy, and a great attraction for the neighborhood! Some people have garden gnomes. Some people have flag poles. Some people have unusual trees. Tom and his family have an extraterrestrial robot!